Tap this page to Apply in Population Welfare Department Lakki Marwat Jobs 2019 Latest Advertisement announced for the residents of Lakki Marwat. 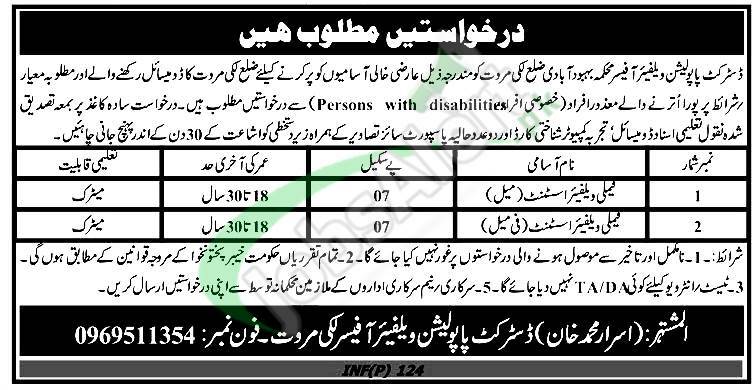 Candidates are welcome to apply for the latest jobs in Population Welfare Department KPK such as (Family Welfare Assistant Male and Family Welfare Assistant Female) on disable person quota by Government of KPK. Candidates possessing qualification from Matric and relevant field skills are welcome to apply on or before the last date 10th February 2019.